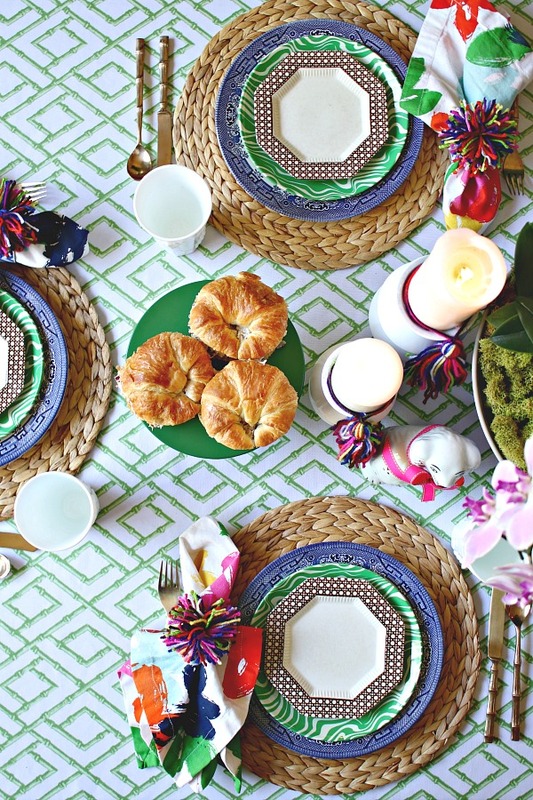 Hello, and welcome in for today's virtual Summer Progressive Dinner Party! 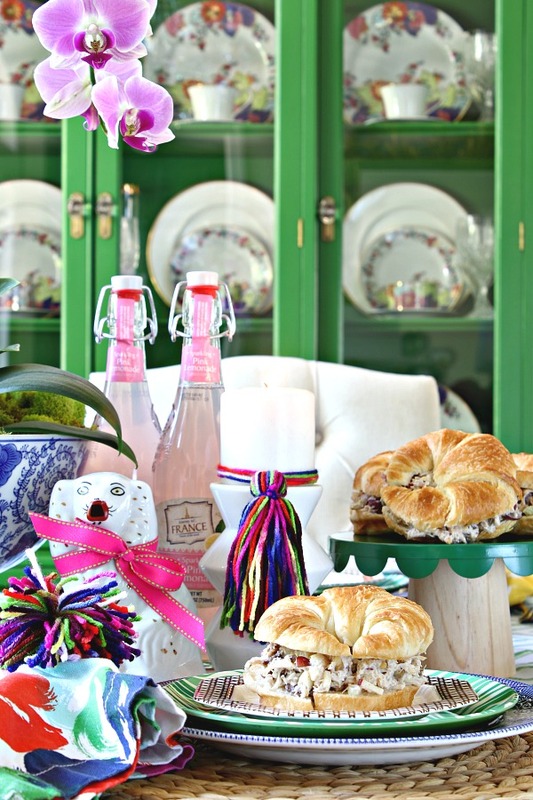 Several friends and I are sharing Summer dinner party themed ideas today, so be sure to check them out through the links at the end of this post. Many thanks to Heather at Southern State of Mind for organizing this party! Summer is certainly conducive to lazy days, easy-going activities, informal get togethers, and definitely simple menus with as little cooking as possible! 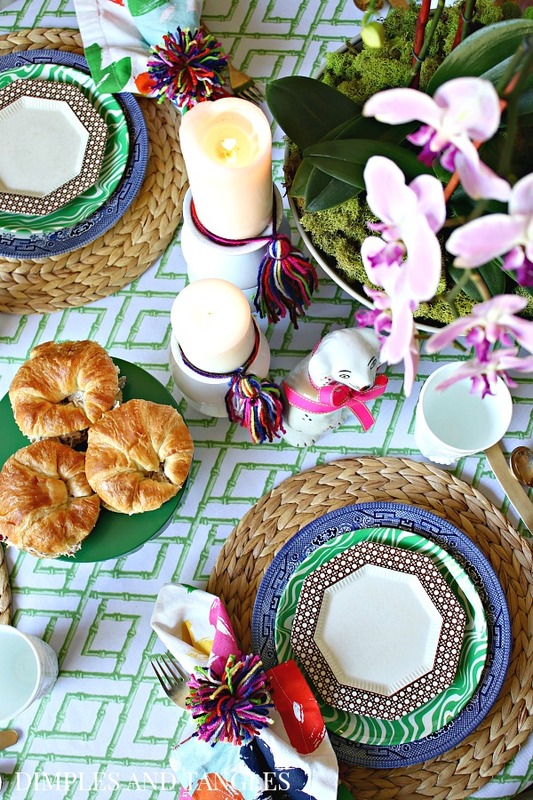 It doesn't take much of an excuse for me to play around with dishes and textiles to set a fun table, so I was happy to put together this colorful tablescape to celebrate Summer. 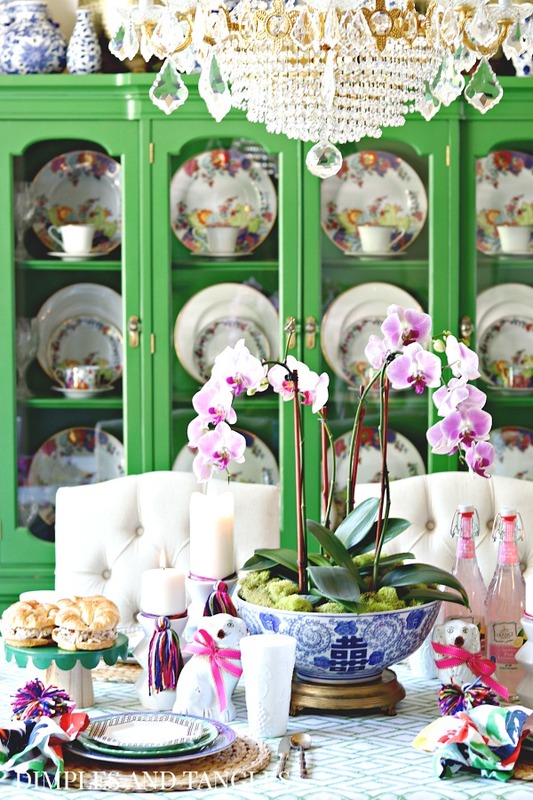 If today is your first time to visit, I embrace color throughout my home and take advantage of any opportunity to mix unexpected colors and patterns. I enjoy the hunt for unusual treasures when shopping thrift stores and yard sales, but also the challenge of incorporating those pieces with newer store-bought items for a unique, eclectic design. For this tablescape I started with a tablecloth from Homegoods featuring two of my favorite things... green and a bamboo pattern. I built it up from there mixing and matching pieces and adding in lots of color to liven things up. 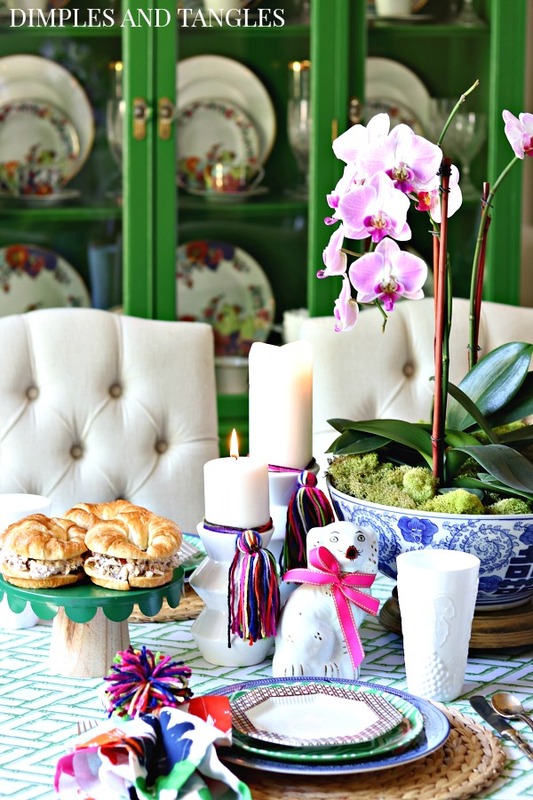 This orchid centerpiece is my every day dining table centerpiece- it's lasted for about 5 months so far(! )- and the colors fit right in so I used it in my tablescape as well. If you're wondering, I've had good results with watering it about every week to 10 days (about 1/3 cup) and it's near a bright window. It's actually three plants grouped together in that bowl and covered with reindeer moss. See my faux/real orchid arrangement here that I put together when the blooms fade. Now, remember when I said summer is all about care free days and no cooking? 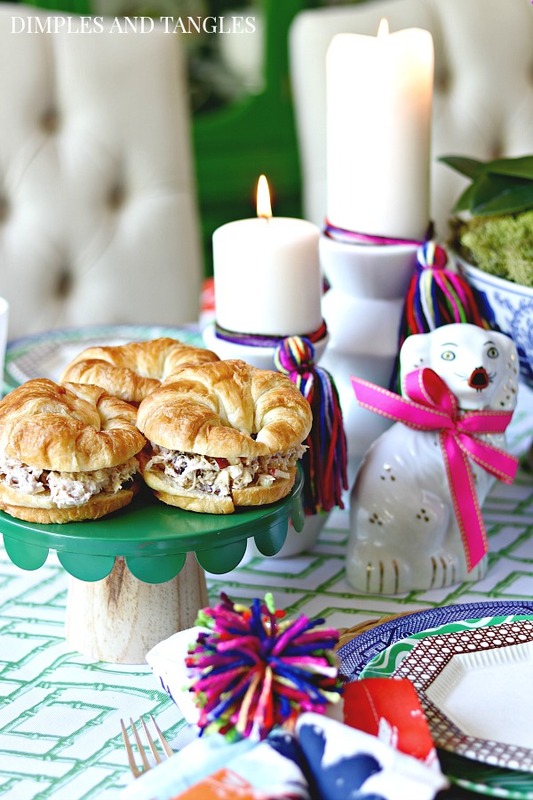 So for an easy, fuss free menu, what could be better than chicken salad on a yummy croissant? I'm sharing my "recipe" with you today... it might have a few ingredients you wouldn't expect! I love chicken salad with a fruit mix in it, but several years ago I found myself experimenting with the spices added to make the mix just a bit surprising. Mix all together in a bowl, separating chicken well. Spread on croissant rolls, makes about 6 sandwiches. I also love to eat it like a dip with Wheat Thins. Certainly the mayo/miracle whip mix is optional (use all mayo if desired), but I like the tanginess that the miracle whip adds rather than just straight mayo. The cinnamon adds a bit of sweetness, and the cayenne pepper just a bit of kick! The amounts of grapes, apples, and celery are also flexible, just add what you think looks good. Served with a simple salad and fresh fruit, your summer dinner menu is all set! And if you really want to treat your guests, make them this pie for dessert... you can whip it up in less than 5 minutes! Thank you so much for joining our virtual dinner party, I wish each one of you could have a seat at the table with me! 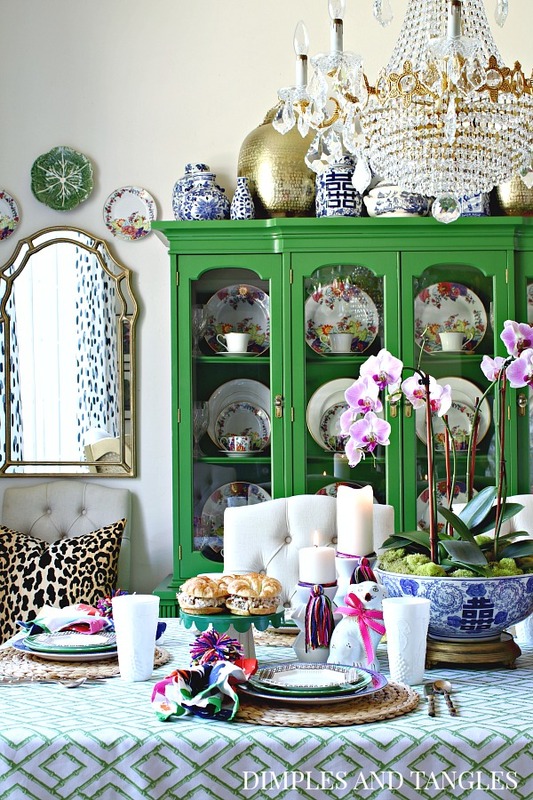 Want to shop similar items from my dining room? Scroll left and right through photos, and click on the item you're interested in seeing more details for. 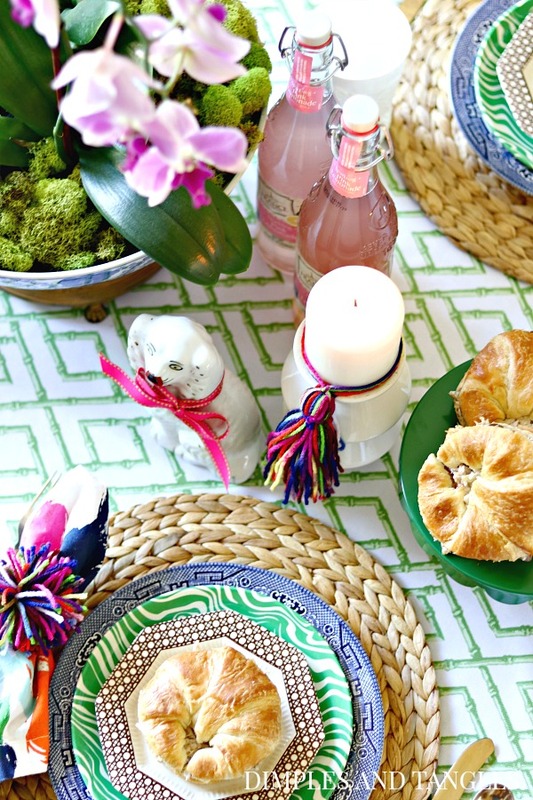 If you weren't around for our Spring Progressive Dinner Party, you can check that out here, and all of my other tablescape ideas here. Chicken salad is my favorite and I love it with grapes and nuts added. Your table is just beautiful and I LOVE that tablecloth! Can't wait for your summer tour! Yes, I think I could eat chicken salad just about every day for lunch! Thanks so much. Thank you, it's fun to pile on the layers and colors! 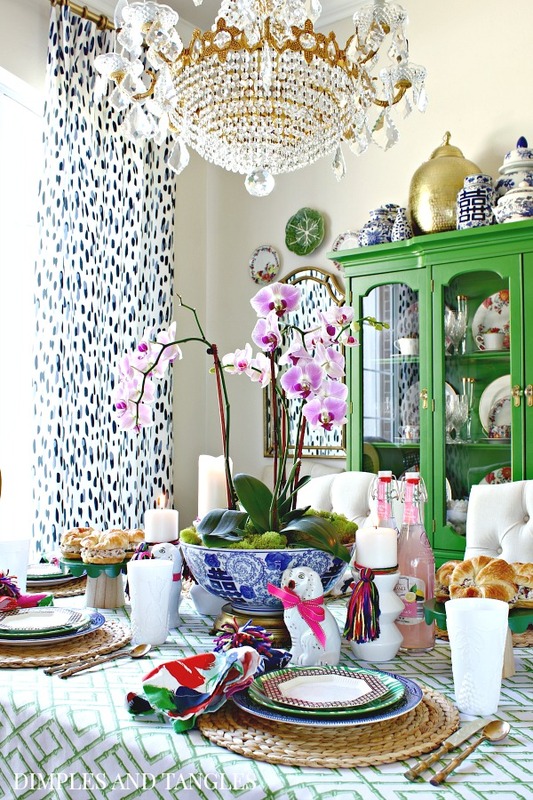 Peppy, classic, ecletic, and vibrant tablescape! 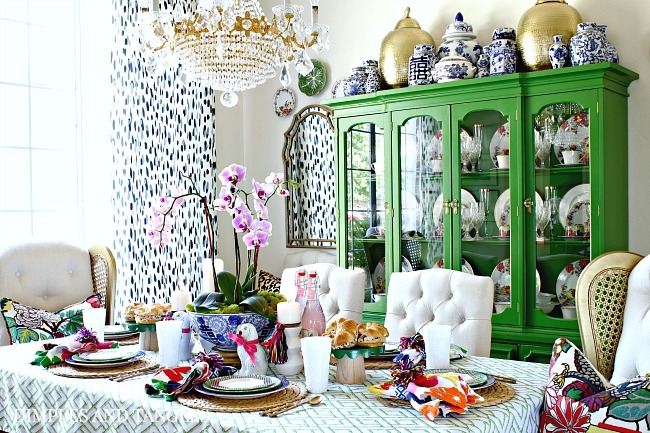 I also love everything from top to bottom in your dining room you excel at combining color and pattern. 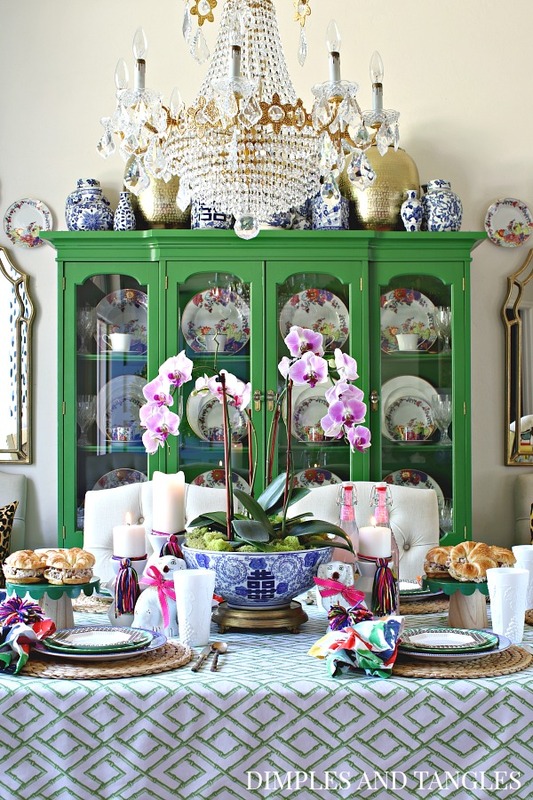 The bright colors are perfect for a summer dinner. 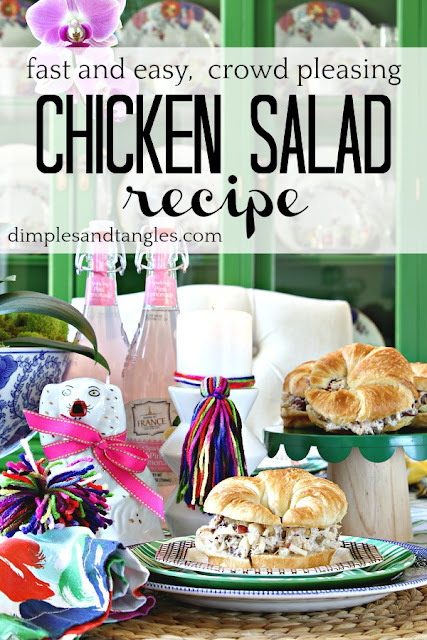 And, your chicken salad recipe sounds delicious. Your house just makes me smile!!! Thanks Stacye, I'm so glad to put a tiny bright spot in your day! As always, your table is stunning. I can't wait to try your chicken salad recipe, it sound fabulous. Thank you so much, Marty. It's such a good lunch or snack! Your table is flawless!! Your pattern play is always THEEEE best! I'm loving your recipe, too. I just made chicken salad last week and like you, could eat with a cracker or with a spoon, for that matter! :) Will have to try some cinnamon and cayenne next time. I'll also have to swing into Aldi and try to snap some of those adorable pink lemonade bottles!! Loved hosting with you and happy, happy Summer!! Can't wait to try your chicken salad recipe. I hope you enjoy it, there are so many little tweaks you can make to suit your taste!